Remember how I recently made coconut vodka? (Easiest liquor infusion ever–just add coconut from that bag languishing in the back of your pantry to vodka for 1-2 days.) Well, I decided to try making a piña-colada-flavored drink with it. DIY Cocktails and I came up with a drink that tastes a lot like a piña colada, but with almost half the calories–around 230 calories compared to 530 calories in a real piña colada. If you want to go even skinner, cut the vodka in half for about 115 calories, less than a glass of wine. The one we made uses three ounces of vodka, which is quite a stiff drink. The Skinny Piña Colada uses only three ingredients: coconut vodka, lime juice, and pineapple juice. I ran a pineapple through a juicer, but canned juice would work just as well. 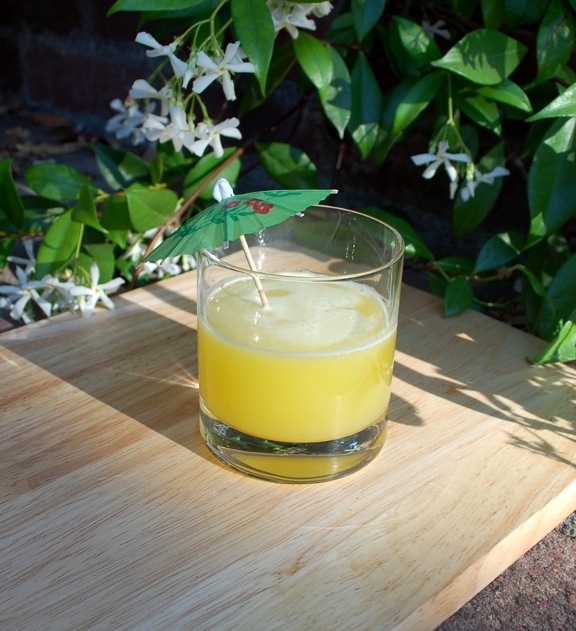 In fact, this is one of the few cocktails I’ve made where freshness is not essential. Canned juice and cooking-coconut-infused vodka is just as refreshing and tropical tasting as fresh. Combine the ingredients in a cocktail shaker. Add ice. Shake drink and strain into a glass. Enjoy!